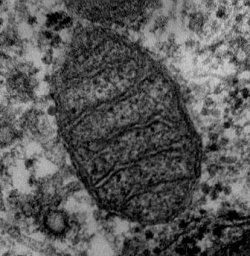 Transmission Electron Microscope image of a Mitochondria from lung tissue. The mitochondria is an organelle found in eukaryotic cells that performs cellular respiration among other things. Cellular respiration is series of chemical reactions through which glucose is converted into the energy carrier - ATP. They are self-replicating organelles that occur in various numbers, shapes, and sizes in the cytoplasm of all eukaryotic cells. Mitochondria contain their own genome that is separate and distinct from the nuclear genome of a cell. Mitochondria also have two functionally distinct membrane systems separated by a space: the outer membrane, which surrounds the whole organelle; and the inner membrane, which is thrown into folds or shelves that project inward. These inward folds are called cristae. The number and shape of cristae in mitochondria differ, depending on the tissue and organism in which they are found, and serve to increase the surface area of the membrane. There are two membranes that are composed of phospholipid bilayers and proteins. The two membranes have different properties. Mitochondria range from 1 to 10 micrometers (μm) in size. 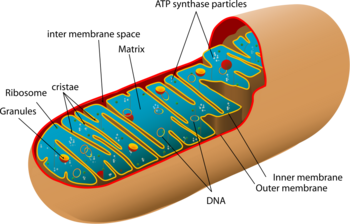 There are 5 distinct compartments within mitochondria. There is the outer membrane, the intermembrane space (the space between the outer and inner membranes), the inner membrane, the cristae space (formed by infoldings of the inner membrane), and the matrix (space within the inner membrane). The outer mitochondrial membrane, which encloses the entire organelle, has about one protein for every phospholipid. It contains many proteins called porins, which contain relatively large internal channels that are permeable to all molecules of 5000 daltons or less in size. Larger molecules can only cross the outer membrane by using an active transport. It also contains enzymes for the elongation of fatty acids, oxidation of epinephrine (adrenaline), and the degradation of tryptophan. The inner mitochondrial membrane contains more than 100 different polypeptides, and has a very high protein-to-phospholipid ratio - more than three for every one. There are a lot of cardiolipins in the inner membrane, which is unusual because they are almost always in bacterial plasma membranes. The inner membrane does not contain porins, and does not allow molecules to pass through without special membrane transporters to and from the matrix. Those that carry out the oxidation reactions of the respiratory chain. ATP synthase, which makes ATP in the matrix. Specific transport proteins that regulate the passage of metabolites into and out of the matrix. The inner mitochondrial membrane is compartmentalized into numerous cristae, which expand the surface area of the inner mitochondrial membrane, enhancing its ability to generate ATP. In typical liver mitochondria, for example, the surface area, including cristae, is about five times that of the outer membrane. Mitochondria of cells which have greater demand for ATP, such as muscle cells, contain more cristae than typical liver mitochondria. The matrix is the space enclosed by the inner membrane. Mitochondrial DNA is located inside the matrix, which also contains many enzymes, as well as ribosomes for the synthesis of protein. Many of the critical metabolic steps of cellular respiration are catalyzed by enzymes that are able to diffuse through the mitochondrial matrix. The other proteins involved in respiration are embedded within the mitochondrial inner membrane. Infolding of the cristae increases the surface area for the enzymes responsible for cellular respiration. ATP synthase, the world's smallest motor, generates ATP in cells. ATP synthase is the enzyme that forms adenosine triphosphate (ATP) inside the mitochondria. It does this by recharging an ADP molecule (adenosine diphosphate) by adding a third phosphate unit. ATP synthase is a large molecule that uses the flow of hydrogen molecules to efficiently reattach phosphate units to ADP. The ATP synthase complexes on the inner membrane of the mitochondria work like an assembly line mounted on a wheel. As hydrogen ions are forced out of the complex the wheel revolves, allowing each of the three active sites on the synthase to convert one ADP molecule into an ATP molecule. In certain situations, the wheel can turn at rates of up to 200 times per second, producing 600 recharged ATP molecules per second. Since there are possibly one billion ADP/ATP molecules per cell, there need to be many ATP synthase molecules functioning to give each cell with enough energy to function. 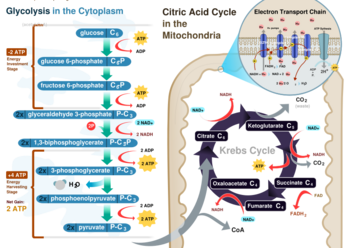 Cellular Respiration involves 3 stages: Glycolysis, the Citric Acid Cycle, and the Electron Transport Chain. A dominant role for the mitochondria is the production of ATP. This is done by oxidizing the major products of glycolysis. This process of cellular respiration, also known as aerobic respiration, is dependent on the presence of oxygen. When oxygen is limited the glycolytic products will be metabolised by anaerobic respiration a process that is independent of the mitochondria. Each pyruvate molecule produced by glycolysis is actively transported across the inner mitochondrial membrane, and into the matrix where it is oxidized and combined with coenzyme A to form CO2, acetyl CoA and NADH. The acetyl CoA is the primary substrate to enter the citric acid cycle , also known as the tricarboxylic acid (TCA) cycle or Krebs cycle. The enzymes of the citric acid cycle are located in the mitochondrial matrix with the exception of succinate dehydrogenase, which is bound to the inner mitochondrial membrane. The citric acid cycle oxidises the acetyl CoA to carbon dioxide, and in the process produces reduced cofactors that are a source of electrons for the electron transport chain. The redox energy from NADH and FADH2 is transferred to oxygen in several steps by the electron transport chain. These molecules are produced within the matrix by the citric acid cycle but are also produced in the cytoplasm by glycolysis; reducing equivalents from the cytoplasm can be imported via the malate-aspartate shuttle system of antiporter proteins or feed into the electron transport chain using a glycerol phosphate shuttle. Protein complexes in the inner membrane do the transfer and the release of energy is used to pump protons into the intermembrane space. This process is efficient, but a small percentage of electrons may prematurely reduce oxygen, forming the toxic free radical superoxide. This can cause oxidative damage in the mitochondria and may contribute to the decline in mitochondrial function associated with the aging process. As the proton concentration increases in the intermembrane space, a strong gradient is established across the inner membrane. The protons can return to the matrix through the ATP synthase complex and their potential energy is used to synthesize ATP from ADP and phosphate. This process is called chemiosmosis and was first described by Peter Mitchell who was awarded the 1978 Nobel Prize in Chemistry for his work. Under certain conditions, protons can re-enter the matrix without contributing to ATP synthesis. This process is known as a proton leak or mitochondrial uncoupling and happens because of the facilitated diffusion of protons into the matrix, mediated by a proton channel called thermogenin. The result of this is the potential energy of the proton electrochemical gradient being released as heat. Thermogenin is found in brown adipose tissue, where it is used to generate heat by non-shivering thermogenesis. Non-shivering thermogenesis is the primary means of heat generation in newborn or hibernating mammals. The concentrations of free calcium in the cell can regulate an array of reactions and is important for signal transduction. Mitochondria store free calcium, a process that is an important event for the homeostasis of calcium in the cell. Release of this calcium back into the cell's interior can initiate calcium spikes or waves. These events coordinate processes such as the release of hormones in endocrine cells. Not all genetic information is found in nuclear DNA. Each mitochondrion has its own set of genes. Plants also have a second organelle, the chloroplast, which also has its own DNA. Cells often have multiple mitochondria, particularly cells requiring lots of energy, such as active muscle cells. This is because mitochondria are responsible for converting the energy stored in macromolecules into a form usable by the cell, namely, the adenosine triphosphate (ATP) molecule. Thus, they are often referred to as the power generators of the cell. There are many diseases caused by mutations in mitochondrial DNA (mtDNA). Because the mitochondria produce energy in cells, symptoms of mitochondrial diseases often involve degeneration or functional failure of tissue. For example, mtDNA mutations have been identified in some forms of diabetes, deafness, and certain inherited heart diseases. In addition, mutations in mtDNA are able to accumulate throughout an individual's lifetime. This is different from mutations in nuclear DNA, which has sophisticated repair mechanisms to limit the accumulation of mutations. Mitochondrial DNA mutations can also concentrate in the mitochondria of specific tissues. A variety of deadly diseases are attributable to a large number of accumulated mutations in mitochondria. There is even a theory, the Mitochondrial Theory of Aging, that suggests that accumulation of mutations in mitochondria contributes to, or drives, the aging process. These defects are associated with Parkinson's and Alzheimer's disease, although it is not known whether the defects actually cause or are a direct result of the diseases. However, evidence suggests that the mutations contribute to the progression of both diseases. Evolutionists believe that organelles such as the mitochondria and chloroplast originated through a symbiotic relationship with an internalized bacteria (endosymbiosis). It is suggested that bacteria was incorporated into the cell, and their genetic systems and cellular functions became integrated to form a single functioning cellular unit. Support for this theory is largely derived from the fact that mitochondria have their own DNA, RNA, and ribosomes. Further support is found by the existence of a eukaryotic organism, called the amoeba, which lacks mitochondria and must always have a symbiotic relationship with an aerobic bacterium. In addition, the energy-conversion process that takes place in the mitochondria is aerobic (with oxygen), while other energy conversion processes in the cell take place anaerobically, or without oxygen. The independent aerobic function of these organelles is thought to have come from bacteria that lived inside of other simple organisms in a mutually beneficial, or symbiotic, relationship, providing them with aerobic capacity. There are many examples of bacteria that live inside animal cells and provide substances that the cell needs to survive. Evolutionists compare two theories, the endosymbiont theory and the direct filiation theory. The first says that organelles like the mitochondria, the nucleus, and plastids or chloroplasts originate by bacteria moving into a cell and becoming adjusted to living there while the second says that the organelles developed inside the cells. However, both take for granted a phylogenetic evolutionary tree that presumes that all cells come from a single ancestor, and so do not even consider the possibility of sudden appearance, or special creation. Of the two, endosymbiosis is preferred, but is not considered to be proven to be better in the case of mitochondria . Difficulties for an endosymbiotic origin include the necessity of presuming that mitochondria arose at least 2 billion years ago because otherwise the logic of the evolutionary tree breaks down. Also, eukaryote cells are presumed to have arisen from archaebacteria and mitochondria are thought to come from eubacteria, but there are no eubacteria presently living that match with mitochondria. There are eubacteria genes in the eukaryote genome, and the easy solution would be to believe they came from mitochondria, but the number of genes is too high for that to be true (more than half the genes in the yeast genome are like eubacteria genes rather than like archaebacteria genes but not like any one lineage of eubacteria). Some scientists have postulated a 'mystery endosymbiont' that became part of cells before the mitochondria did and provided the extra genes, but there is no present day eubacteria that has the necessary combination of genes. Finally, endosymbiosis was slow in being accepted as part of evolution because it does not at all fit with the Darwinian concept that natural selection of descendants can explain all the various kinds of life now existent. Animated cartoon of ATP synthase in action: The 3 shades of red represent the 3 different conformational states of the catalytic subunits. The central asymmetric black object represents the gamma subunit which is caused to rotate by the mitochondrial proton efflux. This rotation drives the conformational transitions of the catalytic subunits which, in turn, alters the nucleotide binding site affinities. As a consequence, conformational energy flows from the catalytic subunit into the bound ADP and Pi to promote their dehydration into ATP. ↑ What is a Cell? National Center for Biotechnology Information. Accessed 20 September 2011. ↑ Mitochondrial Substructure Gwen V. Childs, Ph.D., Accessed 20 September 2011. ↑ 3.0 3.1 3.2 3.3 3.4 3.5 3.6 3.7 Mitochondrion Wikipedia. Accessed 20 September 2011. ↑ 4.0 4.1 ATP: The Perfect Energy Currency for the Cell by Jerry Bergman, CRSQ Vol 36(1) June, 1999. This page was last modified on 19 November 2015, at 15:02.